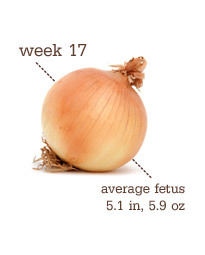 We are 17 weeks today, which makes it "Onion Week" ... probably my least favorite food, but I'll take it! Baby's skeleton is hardening, changing from rubbery cartilage to bone, and fat is finally accumulating around it. The umbilical cord is getting thicker and stronger, and those little fingers and toes are now topped by one-of-a-kind prints. Baby now weighs 5 ounces (about as much as a turnip), and he's around 5 inches long from head to bottom. He/she can move their joints, and sweat glands are starting to develop.